Chez Bruno is one of the most unique restaurants in the world, specializing in dishes that include one of the rarest and most prized ingredients: black truffles. 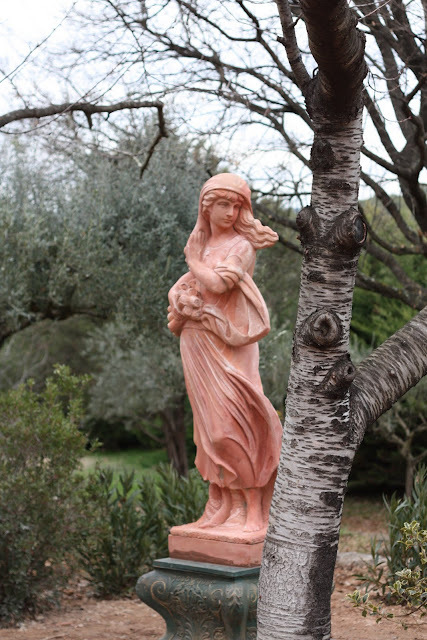 Nestled in the valley of the VAR region on the foothills of Lorgues overlooking rows of grapevines, rests the estate of Chef Bruno, which has been in his family for over two generations. Chef Bruno transformed the house into a dining establishment that hosts one of the most luxurious experiences of the world. A walk into the courtyard will reveal beautiful statues that reflect the simple graceful beauty of the region. 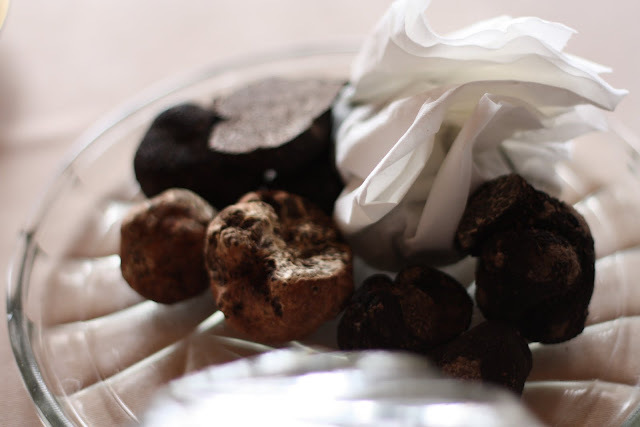 Inside Chez Bruno, following a quick tour of the house, we sat down to a lesson on truffles. 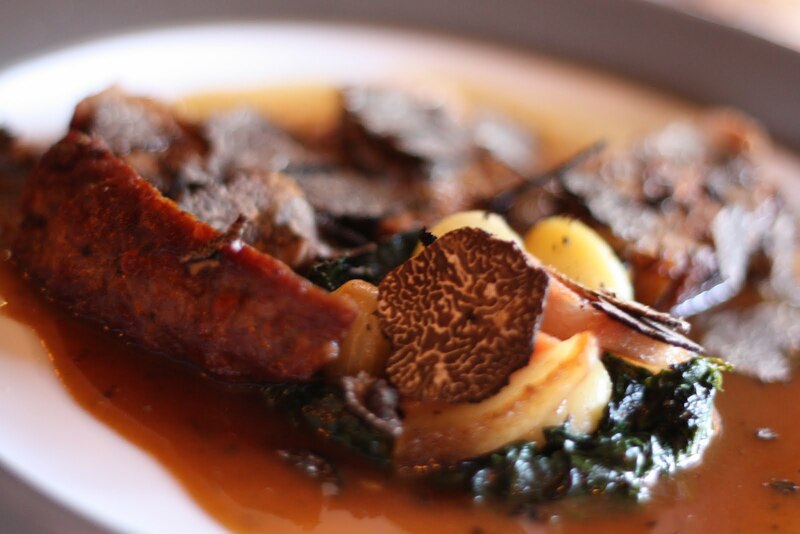 On the plate were Perigord (black) truffles, and white truffles harvested within Provence. At $1200 per pound, resting on the the glass plate in front of me was a mighty fortune. We admired, studied and sniffed the specimen as I wondered how one goes about becoming an expert at this trade. My curiosity drifted, overcome and intoxicated by the complex aromas. 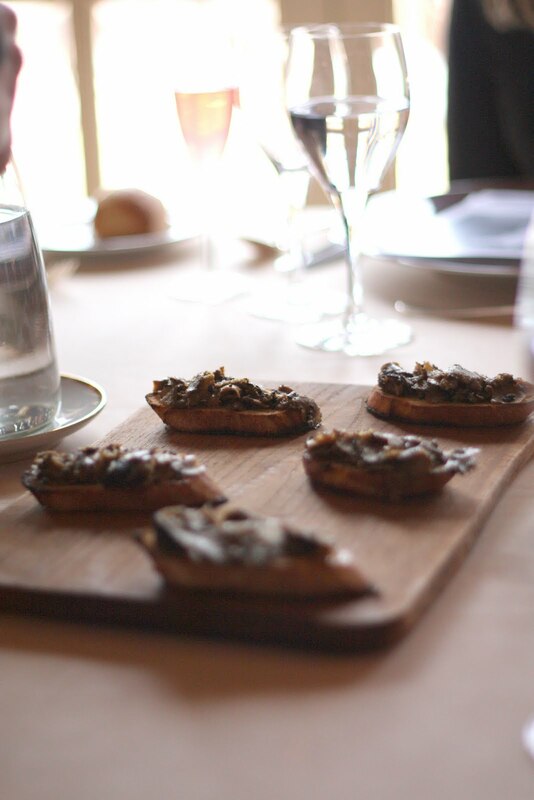 The glass plate of fresh truffles was pushed aside for our appetizer of sliced black winter truffles sauteed in house-made truffle oil, served over a toasted baguette, and slightly seasoned with fleur de sel. 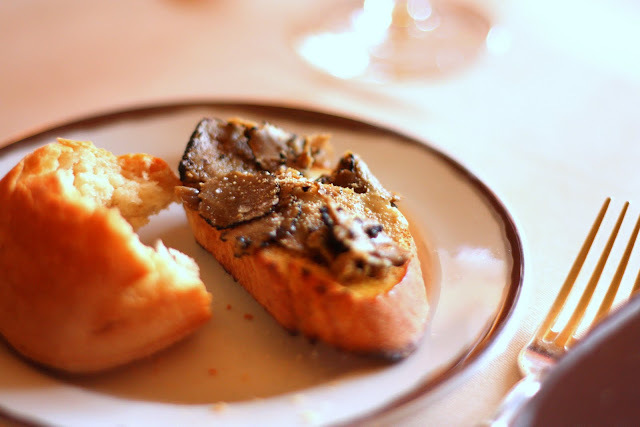 I remember my teeth sinking into the warm earthy aromatic slices of truffles against the crisp lightly charred and buttery bread. A visceral glimpse of heaven was before me. As we were eating, we listened to our host Patrick talk about the various truffles available. 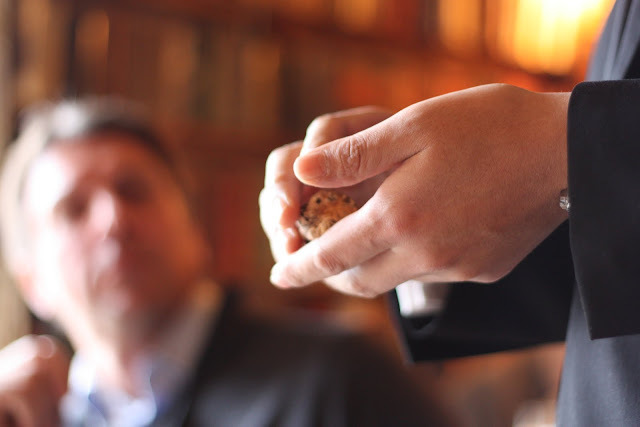 In particular, he showed us a white truffle that was harvested one month too early. He asked us to smell the white truffle, which everyone around the table agreed was wonderful. And then, Patrick did the most wonderful thing...something he's never done before. He whisked the fresh truffles off the plate, and began to slice a generous tasting of several truffle varieties for each of us. Homemade truffle oil was drizzled over the fresh truffles with a light sprinkling of fleur de sel. The tasting was accompanied by three superb wines, two produced locally and one from Bordeaux. A second appetizer arrived at the table. As I broke into the round flaky buttery pastry shell, earthy truffle aromas escaped. 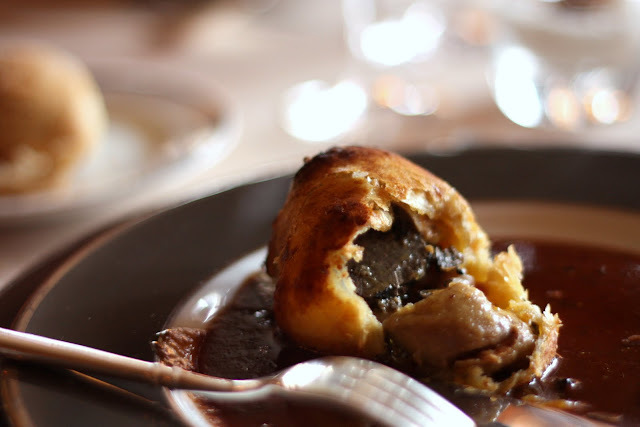 I found a whole Perigord truffle with a piece of uber-rich foie gras cradled together in the crust, all sitting in a luxurious brown truffle sauce. Decadent doesn't even begin to describe it. I think this may be one of the best things I've ever eaten in my life. Following the truffle and foie gras appetizer, we were each served a potato ladled with black truffle cream sauce. Potato sounds so humble, and it is, but this particular potato underwent special treatment. Oven roasted for 2-3 hours, this tuber was immersed in a pampering that yielded a flavor so focused that it could only be described as the essence of a potato. An embodiment, if you will. 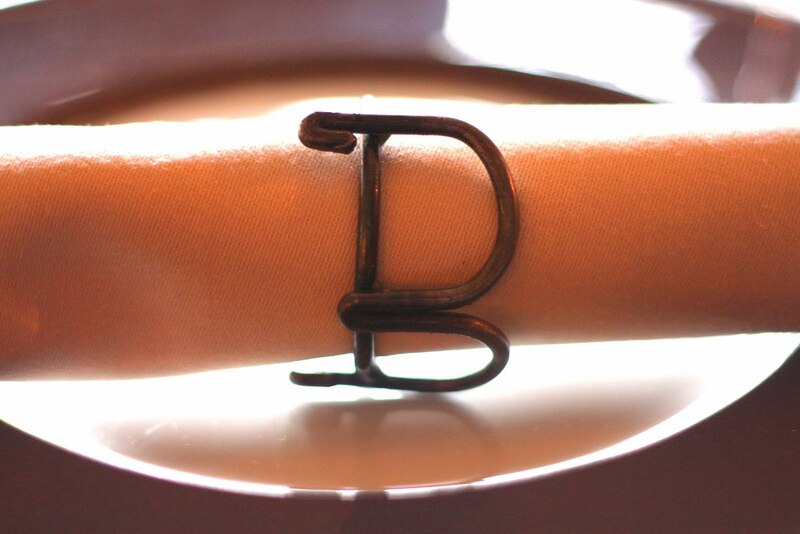 The flesh was so delicate and tender that it crumbled as soon as my fork pierced its surface. 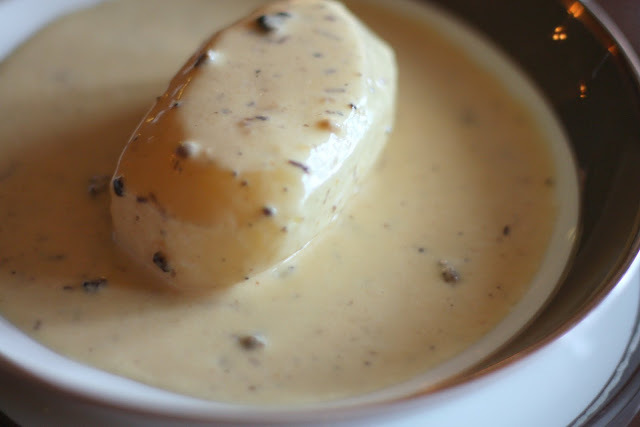 Of course, you didn't expect we were going to be served only a potato with truffle cream sauce, did you? 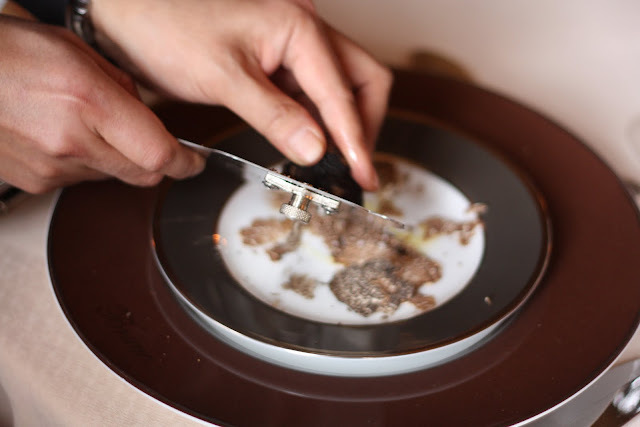 Just as soon as the plate was placed before us, Patrick sliced fresh black winter truffles, drizzled truffle oil and provided a small bowl of fleur de sel. 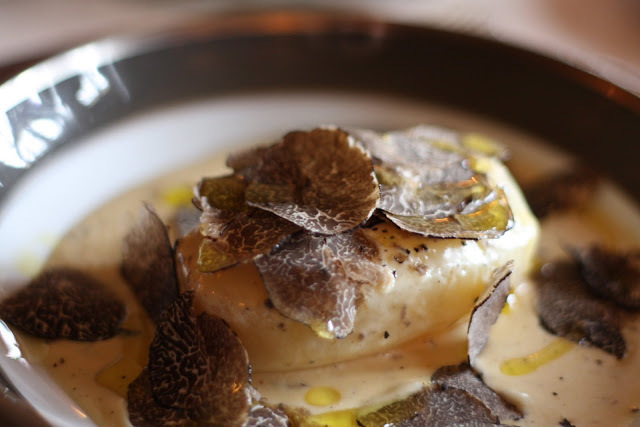 This dish is representative of how truffles should be served, very simply with the freshest ingredients, so that it is allowed to shine in its glory. The potato was just a pedestal made worthy enough for the truffles to stand. 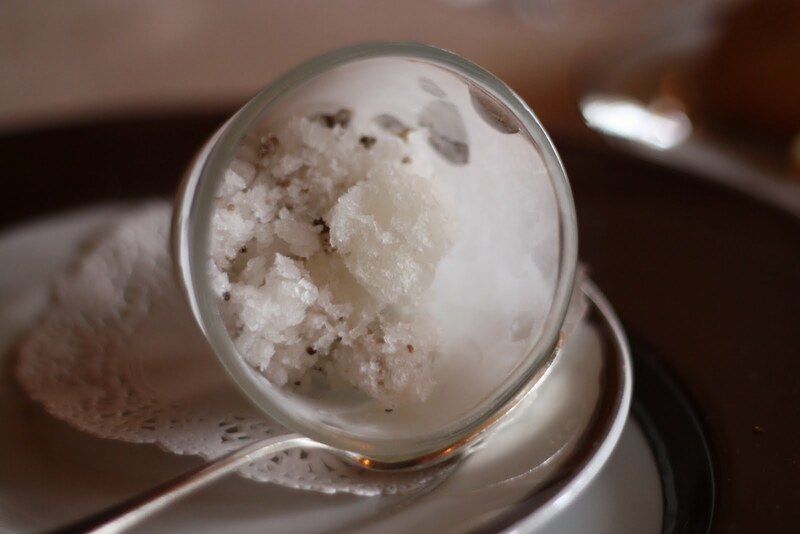 The creamy potato dish was followed by a citron and truffle sorbet for a palate cleanser. For our main course we were served four lamb steaks, well-aged, intense in flavor and incredibly tender. The lamb was sourced from a farm within 40 miles. It was such a shame, at this point I was so stuffed that I left three of the steaks on the plate. Such incredible food should never be wasted. 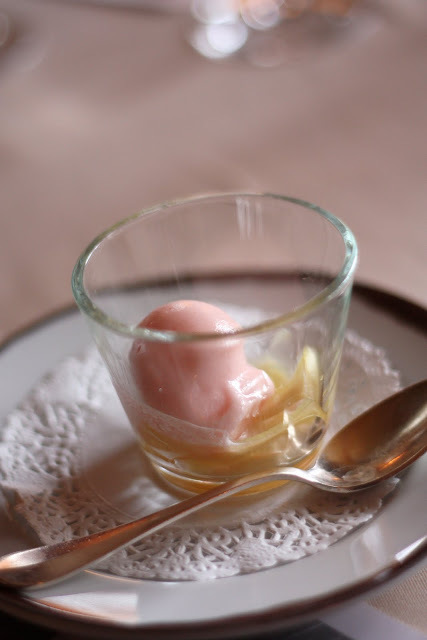 Following the rich tender steaks, we took a respite with a refreshing pink grapefruit ice cream. 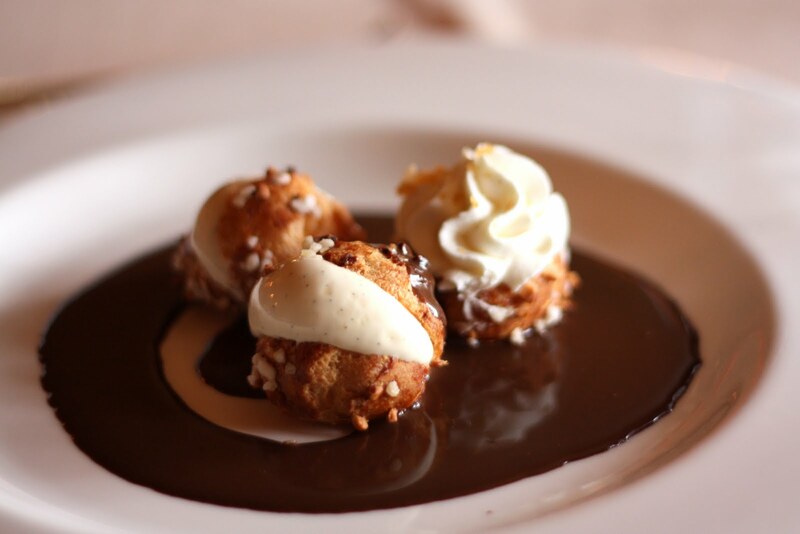 Of course the break wasn't long before we resumed the feast with French vanilla ice cream profiteroles studded with toasted nuts served on a pool of chocolate sauce. I was stuffed but managed to finish the creamy desserts, proving there is always room for dessert. At this point, I was totally stuffed. I looked at the wooden board holding cookies and chocolate truffles warily before me. Took a small nibble of each and was done for the day. It was about at this time when Chef Bruno came to our table, and place his hand on my right shoulder. I instinctively knew who he was, turned to him and gave him a big hug. He asked about our lunch, and needless to say there was only praise. Chef Bruno moved onto the next table. 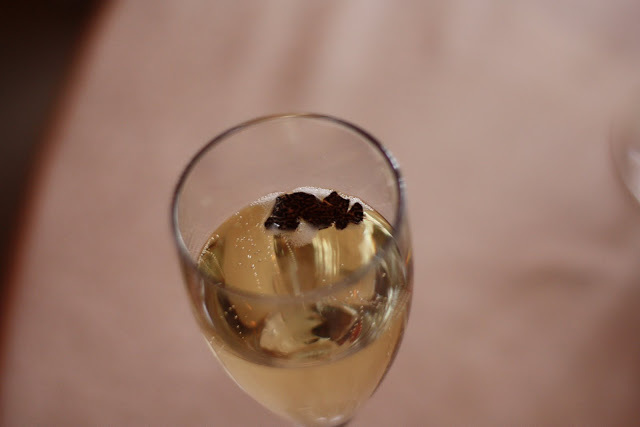 I stared down into my friend's champagne glass and wondered how a slice of truffle got into her flute. 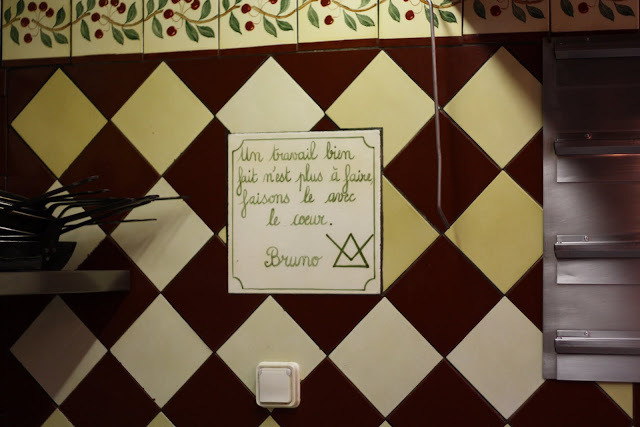 Before I could ask, Chef Bruno returned to the table, and planted a kiss on my forehead, and left. I squealed in delight. Patrick, our host came back to the table, and told me that Chef Bruno previously wasn't having a great morning, but he told the staff that my hug made his day. This remains my favorite and most special memory of the trip. Following lunch we took a tour of Chez Bruno's kitchen. 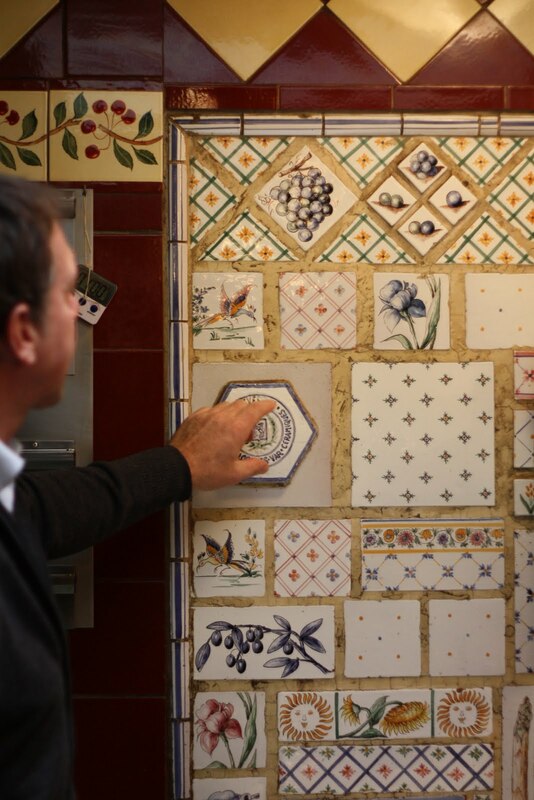 Pierre is pointing out the distinct qualities of various tiles from local regions. I noticed a sign that Pierre translated, which was a beautiful saying, but I don't remember it now. If anyone knows what it means, please let me know. 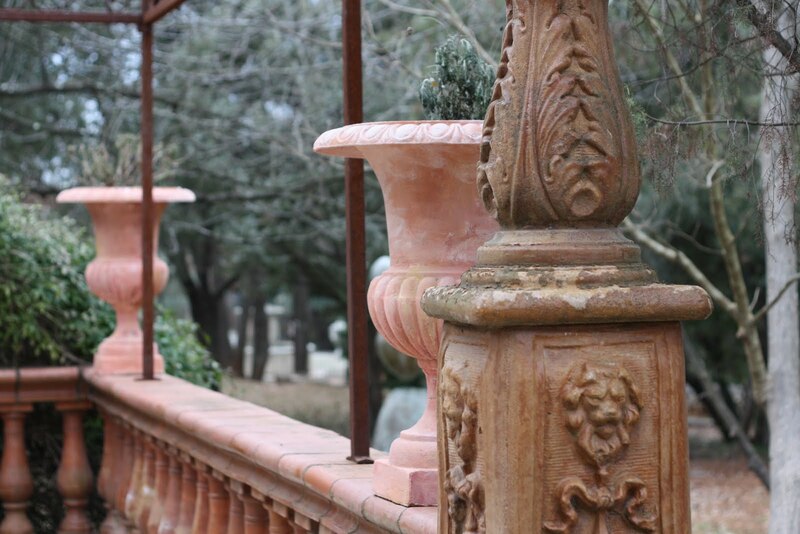 There were rows of beautiful copper pots and garlic braided in long strands. I can't wait to return to this special restaurant again, but I'm glad to have been able to experience it at least once in my life. 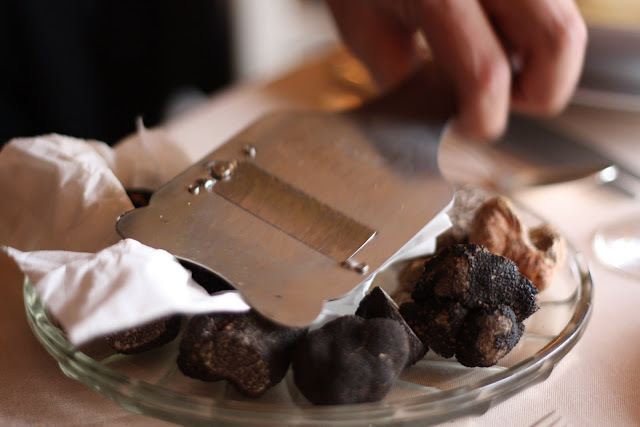 magnificent!you had a amazing experience with bruno and black truffles! OMG!...what a beautiful place! I want to go! and the food outstanding, I'm sure! Enjoy! Beautiful place, gorgeous ambiance and definitely excellent(expensive) food choices. Christine, what an amazing experience for a foodie. France is a beautiful country and with opportunities like this to experience their food culture is just amazing. I bet you have a completely new appreciation for truffles. Christine- What a very special place and Chef Bruno sounds like a total doll! Every plate of food looks magnificent. Fantastic post. Great review of an amazing restaurant. Fabulous photography. Stunning photos!!! I wish I was there. Beautiful pics! 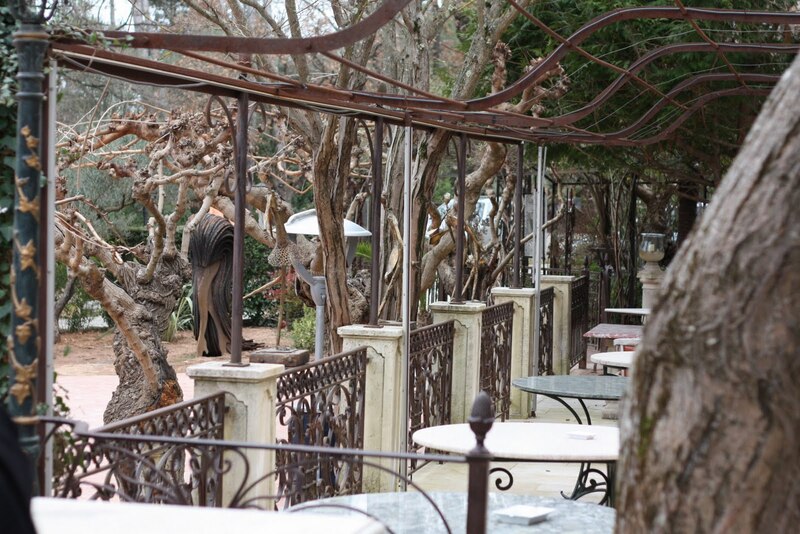 Gorgeous place and excellent mouthwatering foods! You have the most incredible dining experiences and you take the most gorgeous pictures. I would definitely savor every bite and taste of those prized truffles. You found the best restaurants. Great pictures too. I wish I could go! The meal sounds and looks delicious, especially the truffles! Christine, how beautiful. 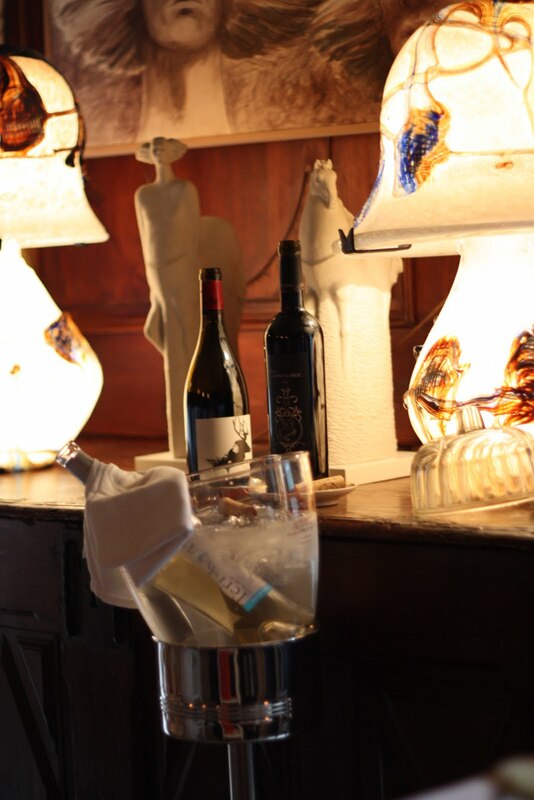 You have made Chef Bruno and his magnificent restaurant a place of delight. Your photos are outstanding. What fun, Christine! 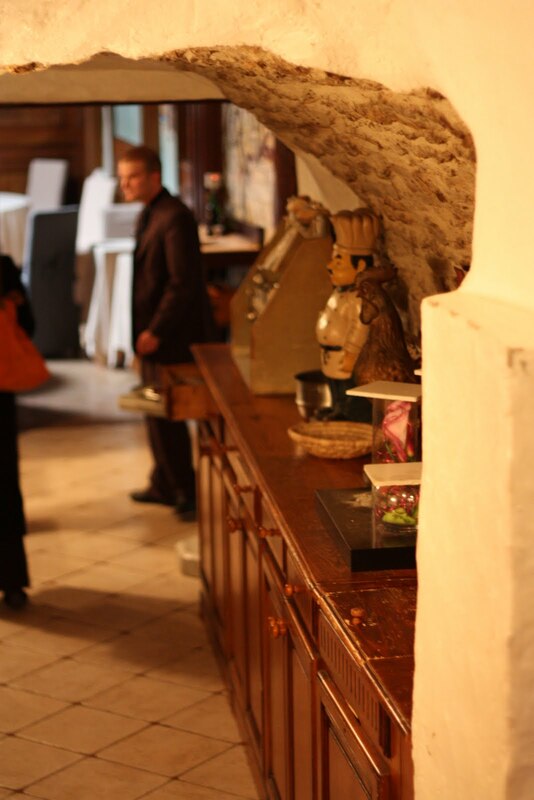 I love your photographs (and your kiss on the forehead from Chef Bruno). The food looks totally divine. I am so jealous! Breathtaking. Truffles might be my favorite thing in the world! You are very very lucky. What a delightful experience. Thank you for sharing your experience and the pictures too. I'm speechless. What an amazing experience. Truffles are to die for. Thanks for sharing! Gorgeous photos!!! I want to be there! 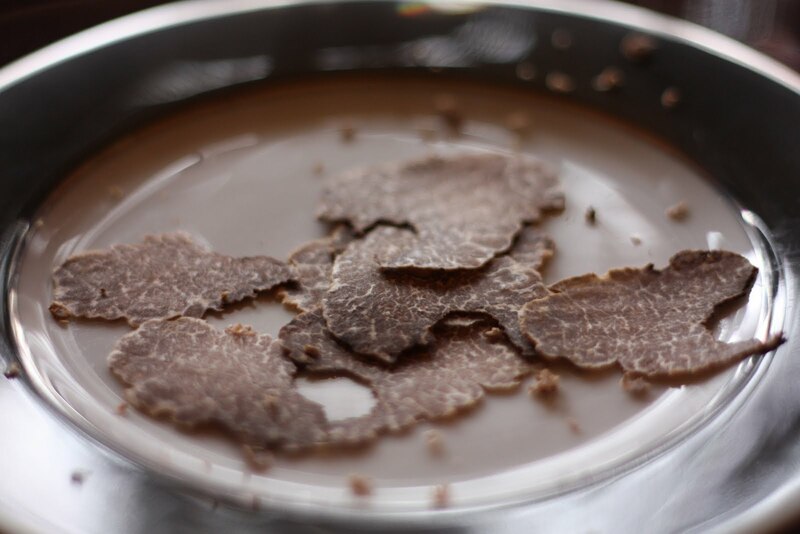 I so agree , this aint only the ultimate in a truffle experience i have some by but also very very special!! sucha lovely place! love your photography skills!!! Fantabulous post...now this place is for sure not to be missed the next time around! oh my, those pictures just say what an elegant place that is! Normally it's only about the food, but this time the place really spoke to me... the red color on those walls took my breath away and conjured up the walls of Pompei... what a gorgeous place. I am still trying to wrap my head around a pastry wrapping foie gras and truffle... this is just too divine. SOunds like Bruno liked you and thought you were pretty special too! 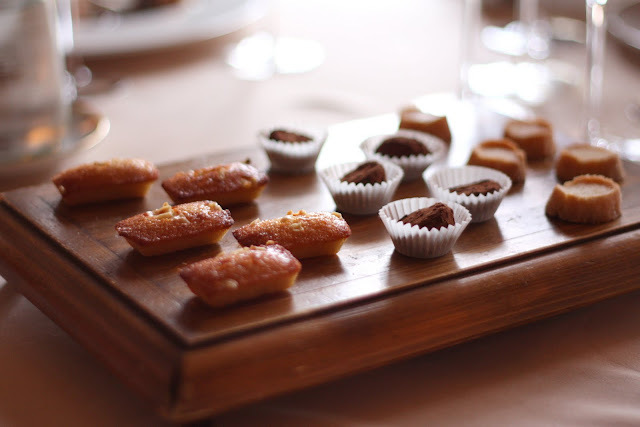 Christine, you have paced the unfolding of your truffle adventure so beautifully---each post is better than the next---but Chez Bruno is clearly the penultimate! My high school French is Very Rusty, but essentially the saying is that Work is never done well unless we do it with Heart. What a generous and delicious meal! I can't even fathom all of the truffles that you ate. How fabulous. Thanks for sharing such gorgeous photos...I feel like I was there. Absolutely beautiful! 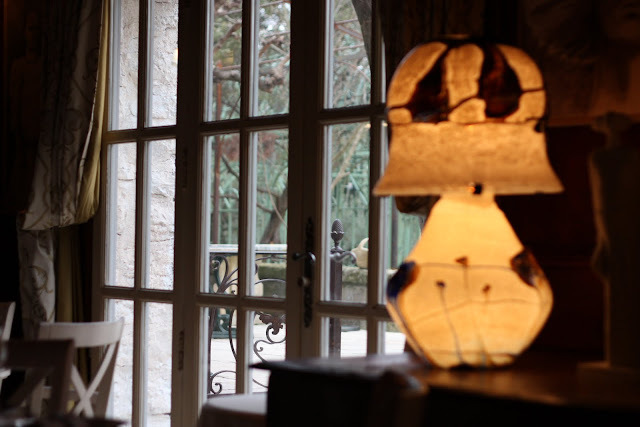 The restaurant and truffles all take my breath away. The language of a hug, a smile is worldwide. Kudos to you for following your heart. Which is what the French saying says - working with your heart. Chef Bruno's heart is clearly all over the place. Beautiful pictures, I enjoy visiting your blog to be transported to the places you visit. Enough of these truffle stories-you are making me hungry and envious-I want to return to France now. Your trip seems like it was truly amazing. 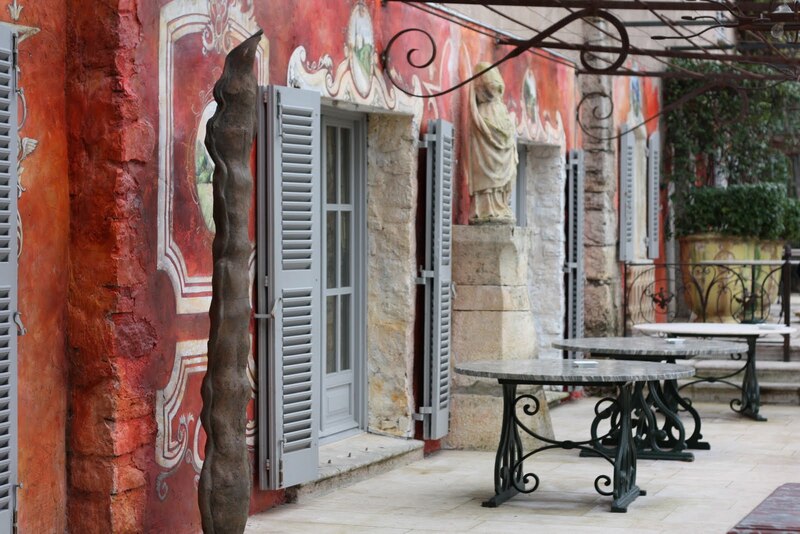 We're planning a trip to France next summer - must put this place on my list. Are you headed to Blogher in August? If not, would love to meet up with you when I'm in NY. There will be lots of fun parties. What a great story--you had such a good trip. The restaurant is beautiful and the food looks amazing too. The photos of the truffles are just so sensual! I am entoxicated, too! 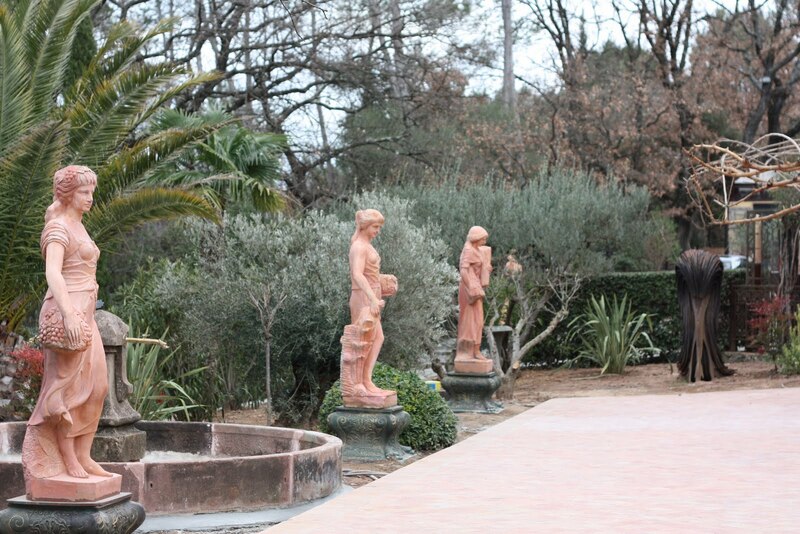 And the home and gardens are stunning. Your post is wonderful, Christine. Thank you for sharing your gorgeous photoso of that amazing meal. Lunch at such a fine restaurant was quite an experience, and meeting the Chef Bruno made it perfect. Thanks for continuing to share your experience with us Christine.This is a dream vacation for many of us. Oh my what an amazing experience! I'll take the three extra lamb steaks. Christine... did you write about Chez Bruno's before... I seem to recall another post mentioning it - or about it... in any case, the lunch looks spectacular. Your descriptions are, as always, incredibly vivid. And, the photography in this post is brilliant. This is definitely a place I will seek out whenever I find myself in this region. What a wonderful experience. We are trekking back to Europe this summer and to Paris for a week... so different than the countryside - but I am NOT complaining. I am thrilled. 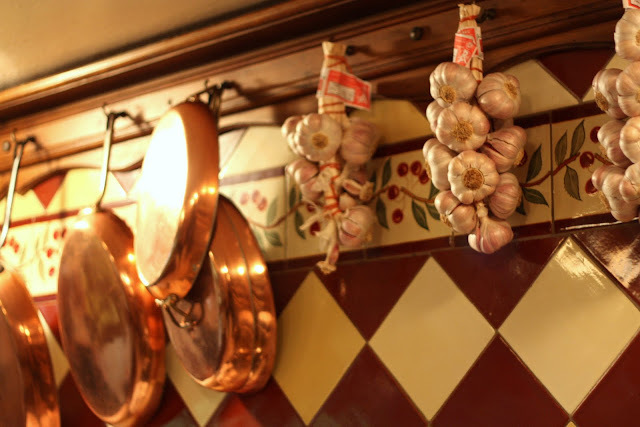 Have three cooking classes booked, and just cannot wait. I'm feeling a little dizzy and very happy after looking at all those truffles! What an amazing meal. That's my version of heaven. Great post Christine! and what a luxurious experience you had! Thank you everyone for your kind comments. This was a very special experience for me. It is wonderful to be able to re-live it with you guys. Also a very special thanks to Taste of Beirut for translating the tile for me. So poetic. Okay, this is one of those posts that makes me EXTREMELY jealous! Beautiful, gorgeous, delicious, magical...wish I was there! Plus, I looooooooooooooove truffles. YUMMY post. What an experience! Such an incredible meal. Beautiful photos of course. What a gorgeous place! And you took some fascinating pictures! What an incredibly once in a life time experience. As soon as I can, on a trip to France, I am going to check in with Chef Bruno. Those dishes looked absolutely incredible. The puff pastry one, looks like it could be the apple of Eden its so tempting. What an amazing thing to be able to connect with the chef like that, so cool, and what a great memory to have. Really a unique place you can't find many places specialized in expensive black truffles. You hugged Chef Bruno and he gave you la bise!!!! This post is exquisite Christine. Well done capturing this in words and pictures. I loved reading about your fabulous experience but your photos really make it even more special! I felt like I was there with you (I wish). The translation of the tiles is beautiful. One of the best posts I have ever seen. My friends and I are planning to visit France and I will recommend that we should visit that place. I am sure that they will agree to me.